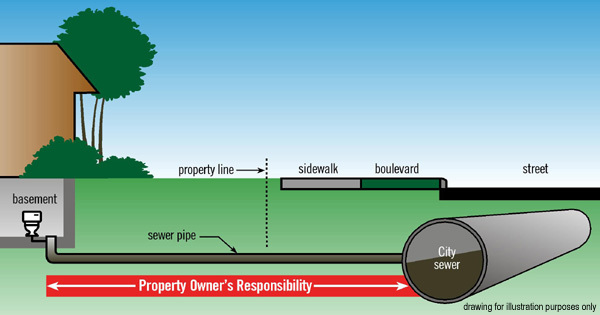 You own the sewer pipe from your building to the City's sewer main. This includes the part under your property and the part under City property. Your home or business insurance policy may cover sewer backup. We are not responsible for sewer backup unless we have been negligent. If you believe this is the case, you or your insurance company can make a claim. Arrange and pay for a sewer cleaning contractor to clean your sewer (see the "Plumbing – Drain & Sewer Cleaning" listings in your MTS Yellow Pages Phone Book). The sewer cleaning contractor may be able to clean out any debris or buildup, and restore your sewer services. If the contractor cannot restore your sewer service due to a blockage, either under your property, or City property, continue with step 2. Arrange and pay for a licensed sewer contractor to make any repairs. If the second cleaning attempt is unsuccessful and the sewer is still blocked, we will arrange and pay for the repair. During this time, you may be without sewer service. If you have any questions, contact 311.